For once in going to review a non-fiction book. 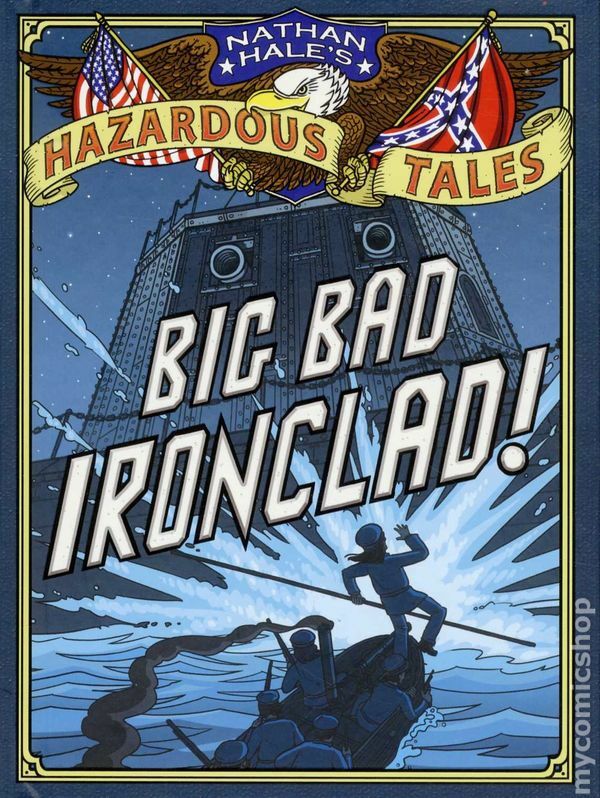 It’s a book called “Big Bad Ironclad” by Nathan Hale. This book features the historical spy, Nathan Hale, telling the story of the ironclads to his executioners. 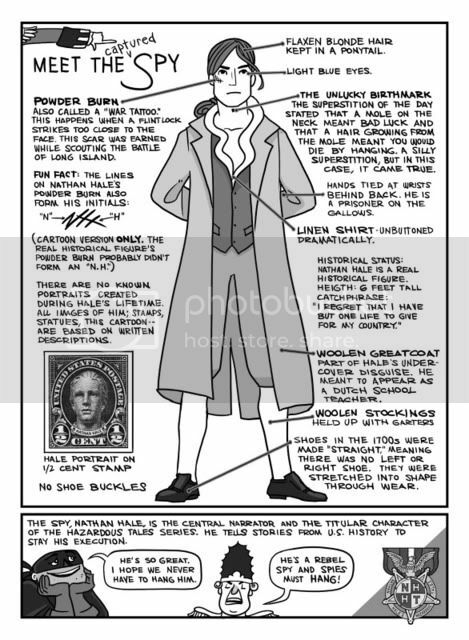 As most of you know, Nathan Hale was not alive during the Civil War. But in the story, he somehow read a history book that told him the future. The main characters of the story within the story are the historical characters, William Cushing and Gideon Wells. The villain of the story within the story is Stephen Russell Mallory, the Secretary of the Confederate Navy. When the Confederates steal the U.S.S. Merrimack, Mallory has the top plated with iron. It is also renamed the C.S.S. Virginia. While it is in the works, the Union navy board has been searching for an inventor to build them an iron ship. When John Ericson auditions they are very hesitant because John Ericson built a cannon for the navy that blew up. It killed 8 people including the Secretary of the Navy. Abe Lincoln finally convinces the navy board to sign a contract with John Ericson. When the Monitor is finished, it fights the Merrimac. If I tell you more it won't be interesting. One scene I like is when the Union army is attacking the Confederate shipyard and the Confederates have to blow up the wounded Merrimack so the Union won’t get it. I liked this scene because it shows how powerful a healthy ironclad can be. The artwork in Big Bad Ironclad is unbelievably cartoony. It is not my favorite, but it is not my least favorite ether. It feels smooth instead of rough like Usagi Yojimbo. Overall, its not bad at all. 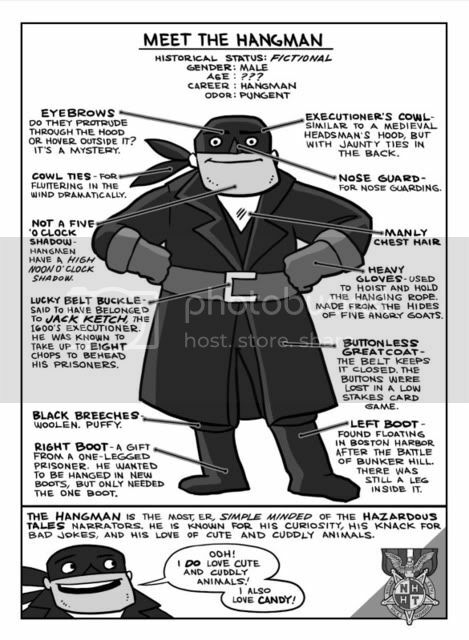 Additionally, I really enjoy all the childish humor, such as how much of a kid the hangman is. 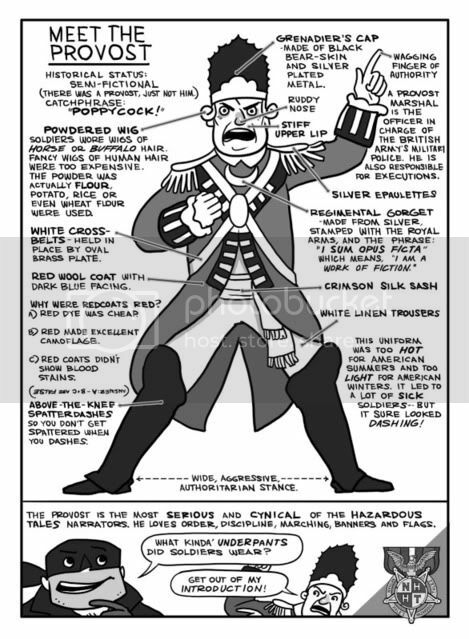 The book is good for history lovers and comic lovers, of which I am both. So go check it out. It’s very entertaining. "If I tell you more it won't be interesting." That is an awesome line. I ROFLMAO'ed. I am a history lover AND a comic lover. Based on this recommendation, I will be reading this book! Still hoping you'll start linking to a seller--I keep forgetting to go to the bookstore! I think I know a kid who might like this book too! Thanks! Thank you for the review. Based on your recommendation, I will buy it and I look forward to reading the comic! I liked the review of the artwork. I just discovered your blog because your mom wrote about it in the EAST VILLAGE INKY. Great work! This particular graphic novel really caught my eye because I work for a publishing company that puts together collections of great literature for kids, and we're always looking for new genres (like graphic novels) and also really looking for interesting nonfiction. This one looks really great... I will check it out. I look forward to hearing about any new, great nonfiction you read!